5 February 2015, at 9:26a.m. UGANDA - Feed assessment training has the effect of increasing the availability of local feeds for the country's smallholders who keep pigs. For the typical Ugandan pig producer, getting the right quantity and quality of feed in a cost-effective manner remains a major challenge, writes Brian Kawuma for the CGIAR Consortium of International Agricultural Research Centers. Competing needs for land for housing and crop production leave very little or no land for growing animal feed, leading to an over-reliance on purchased feeds. But these feeds are expensive. Keren Zaake, a farmer from Mukono District in central Uganda, explained: "I spend at least UGS300,000 (US$105) to buy feeds each month for my three pigs but I haven’t made as much from the sales." Like him, many Ugandan pig farmers rely on locally purchased feeds for the major part of their pigs’ diets. However, the quality of these commercial feeds is not standardised. The animal feed industry in Uganda is largely unregulated and the country does not have a national policy on feed manufacturing and quality. A 2013 report on the Pig Value Chain Impact Pathways showed that most feed processors in Uganda produce substandard feeds, with substandard and infected feeds common in the supply chain. In addition, these feeds are then sold at exorbitant prices to farmers. Previous research efforts have not covered much ground in relation to formulation of feeds that are appropriate for smallholder farmers’ needs. 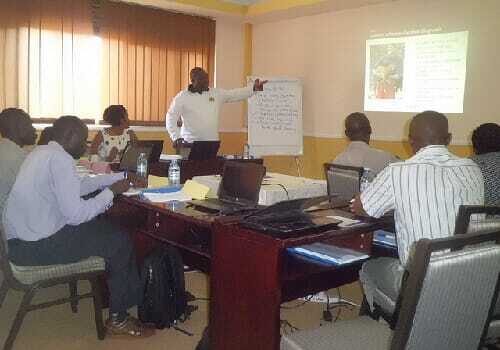 To help bridge the gap and to promote improved feeds for livestock in the country, a four-day training on the Feed Assessment Tool (FEAST) was held in Wakiso District in Uganda in December 2014 for non-technical feed experts and private and local government extension workers. Facilitated by Ben Lukuyu and Joyce Maru from the International Livestock Research Institute (ILRI), the training introduced participants to the tool and included a hands-on field testing of the tool with 20 pig farmers in Matugga, Wakiso District of central Uganda. Preliminary findings from the field test revealed land shortage in this peri-urban district as the major constraint to cultivation of feed crops and shed some light on the over-reliance on purchased feeds by the majority of pig farmers there. The data collected in the field testing exercise will be analyzed to inform possible interventions to support pig farmers’ efforts to improving the availability of locally available feed resources and the quality of their animals’ diets. These interventions are part of the Irish-Aid funded More Pork for and by the Poor Project, which is implemented by ILRI in Uganda. The project is testing and piloting best-bet options for improving the production, pork safety and household nutrition for all actors in the pig marketing chain in Uganda. The FEAST tool will be used to characterize pig production systems and local feed resources in project sites in Lira and Hoima districts. Feeds assessment is part of the entire value chain assessment exercise that the project will execute before testing and piloting its interventions in the pig value chains in the two districts.